In 2016, gross sales under banner rose by 1.1% to EUR6.815bn, with an increase in comparable sales of 1% and a limited contribution of new openings and acquisitions. Net sales decreased slightly by 0.2% in 2016, reaching EUR5.746bn. This drop is due to the closing of some stores in Spain, such as El Árbol and DIA, with lower-than-expected profitability (reflected in a 2.9% decrease of the commercial area in Iberia), the refurbishment activities carried out during the year (mainly in El Árbol and DIA Maxi) and the transfer of own stores to the franchise network (243 transfer operations completed in 2016). Adjusted EBITDA climbed by 1.4% in 2016 to EUR508m, of which EUR147.1m were generated during the last quarter of the year, 2.8% higher than the figure recorded in the same period of the previous year. The strong performance of this item in the last quarter was due to the positive business performance at the end of 2016, together with improved purchasing conditions and the excellent implementation of the different cost improvement plans. The adjusted EBITDA margin remained practically stable, with a slight improvement of 13 basis points to 8.8%. As already announced at the beginning of financial year 2016, depreciation and amortization expenses fell by 3.5% during the last quarter, reaching EUR42.5m. Regarding the year as a whole, depreciation and amortization in Iberia rose by 8.3%, to EUR178.4m, due to the temporary impact of the recent acquisitions completed. Adjusted EBIT slid by 2% in 2016, to EUR329.6m, representing a reduction in sales margins of 11 basis points to 5.7%. However, in the last quarter of 2016, adjusted EBIT increased 5.7% to EUR104.6m, representing an improvement in margins of 58 basis points to 7.3%. 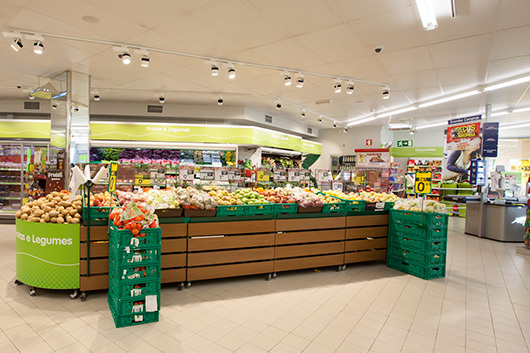 The fall in margins for the year as a whole is mainly due to business performance in Portugal, although the greater weight of the supermarkets within total sales had a certain impact on profitability. During 2016, DIA continued to improve its commercial network with the refurbishment of a total of 307 stores. This plan, in addition to improving the customer’s experience in the store, strengthened the product offering with the inclusion of new categories in the product range and a greater commitment to fresh produce. Accordingly, as a result of the commitment to specialization at the end of 2016, close to 1,000 stores had meat, delicatessen, and fish areas, amounting to more than 2,000 sales counters between establishments in Spain and Portugal. In regard to the adaptation and integration of the new fleet of stores and the new banners, the company continued to work on its transformation process. Specifically, a total 143 stores of the El Árbol format were transformed to La Plaza de DIA, a number higher than the 95 planned at the beginning of the year. For their part, gross sales under the Clarel banner reached EUR349m in 2016, improving by 6.5% versus the previous year, while gross sales under the La Plaza de DIA banner reached EUR866m.